Pratunam Park Hotel and the White Palace Hotel are both at the end of Pratunam Market itself and impossible to beat for convenience. If you are making a lightening wholesale shopping trip to Bangkok then staying in either of these hotels, doing your shopping just meters down the road, then arranging shipping via a fright forwarder opposite the hotel, will make your trip more efficient. Other choices include Citin Pratunam hotel, which has both an old and a new building, and the smaller Khurana Inn. While Budacco Hotel is inside the market area itself. 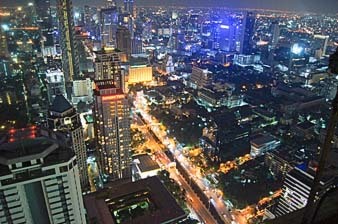 Overlooking all this of course is the 5 star Baiyoke Sky Hotel in Baiyoke Tower itself. Which together with Amari Watergate Hotel and smaller Baiyoke Suite Hotel form a triangle around the market. A few minutes walk along Phatchuburi 21 is The Grand Diamond Suites Hotel which is beside the Platinum Fashion Mall. For a longer stay just behind Baiyoke Tower is KC Place Serviced Apartment where weekly or monthly stays are possible. If none of the Pratunam accommodation options appeal to you then of course Bangkok has many other hotel choices.